Reference material for Remington Rolling Block Firearms. Some information that has been printed in past years regarding these firearms is not accurate. There is no single comprehensive reference on the subject. We now have four books that no serious collector of Remington Rolling Blocks should be without. In addition to the first three listed on this page see Landskron on RB Pistols. Many of these texts are now out of print*, as such the supply is unpredictable. Remington Rolling Block Rifles, Carbines & Shotguns, Sporting and Target Rifles. Newly published book with extensive information on the Sporting (civilian) rolling block rifles manufactured by Remington from the 1860s to 1933. Hardbound with dustcover, 350 pages 10 x 12 inches. The photo composition and detail in this text is amazing. This is a very welcome book given the dearth of organized information on rolling block rifles in general and civilian models in particular. Trade edition retail list price $100. The Deluxe edition is leather bound in a slip case, retail list $165. All books come with insert signed by all three author/contributors. Military Remington Rolling Block Rifles of the World. Released 1/15/2010 at the Las Vegas collectors show. Hardbound 238 pages organized by region and country. 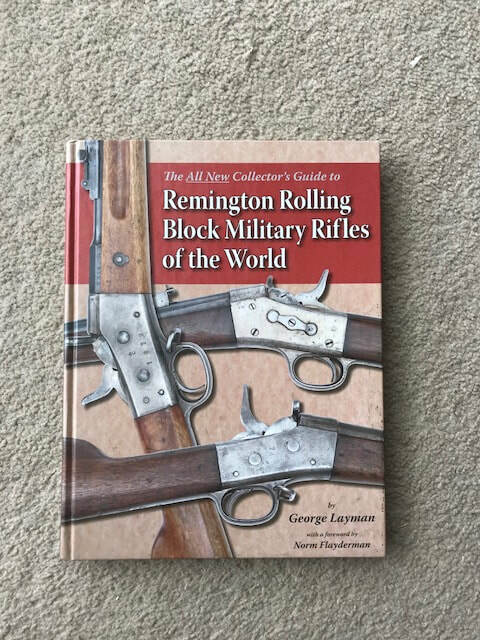 Norm Flayderman states "....exhaustively researched, newly introduced Guide to one of the world's most successful military rifles....it is difficult to avoid unstinting praise for author George Layman's all-new ground breaking study." The .58 and .50 Caliber Rifles & Carbines of the Springfield Armory, 1865-1872. This is the first of a series of books on sporting model single shots. The book has two chapters devoted to rolling blocks including a 50 page chapter on the Remington Rifles. We believe this book is out of print. Photo is a file photo only. We will attempt to have a copies of this book available, price varies with condition. This is the second of the series on Single shots written by Grant. This is a first printing Ex-Lib. It has a dust cover under plastic with the attached envelope on the Fly. The Library name is embossed into the first two printed pages. All the pages appear bright and clean. Page 39 has a tape repaired tear. The cloth cover is fraying along the bottom edges and the top corners (probably from sliding across the shelf when Libraries were allowed to stock gun books). My wife says the book has an odor. We have another better grade copy for $45. Out of print book so Please contact us prior to ordering as these are not stock items & are subject to prior sale. 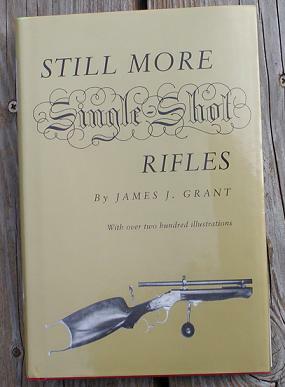 James Grant fills in, embellishes and gives more in-depth information on those single shot rifles which were not presented in the first three books. This is not a revision of any of those books, but more a sharing of the knowledge he has gleaned from collectors, museums, etc. This book is currently published and we keep this volume in stock. This is the third book and the jewel of the series. Rare book it is very difficult to locate in any condition. Hard bound 597 pages, with dust cover. The dust cover is price clipped and has some small tears or splits most along the bottom edges. The book is showing some edge wear along the bottom of the cover and ends of the spine. There is a small pencil smudge on the upper right corner of the fly otherwise the pages are crisp, sharp, and unmarked. This is an excellent book in very good condition. $125 TO $175.00 + $7.50 Ship & Ins. As might be guessed by the title this is the last book in the series by Grant. Wolff publishing. A rare book. 133 pages of single shot rifles. $150.00 + $5.00 ship & ins. This is the 1993 Deluxe 1st edition of Jansen's book. It is hardbound Maroon faux leather binding. This book not only contains much detailed information on Bayonets, it also has information on the Rolling Block Rifles with which the Bayonets were issued. These books are New Old Stock still sealed in the original plastic. Rolling Block Press, Buena Park, CA. Rare out of print book. Oversize hardcover 296 pages. Simulated ? red leather with gold embossed pistol. This is a well organized book with very detailed information regarding the Remington Company, contracts, with correspondence between Remington and various branches of the military. This is one of the best texts on rolling block firearms available anywhere. We have acquired a very limited supply of these books and thus can offer the new price of $100 for this inventory. Stated First Edition. Soft cover. This is an out of print book. A great reference for the inner workings of many single shot receivers. 11 chapters on various rolling blocks alone. This is an indispensable reference book for single shot owners. File Photo Only. Until the de Haas family chooses to reprint this volume the only source for this book is the used book market. We will attempt to keep copies of this book in our inventory. Please contact us prior to ordering as this is not a stock item & is subject to prior sale. This book, More Single Shot Rifles And Actions, Volume II in the series on single shot rifles and actions, covers over 45 different single shot rifles in the same familiar style as the original SINGLE SHOT RIFLES AND ACTIONS book. Included is the history of these rifles plus photos, drawings and personal comments of the author. Several of the rifles covered are the Farrow, Mortimer, & Kirkwood, Kentucky Ballards, Starr, Bullard, Maynard, Wurfflein and many more. ​Out of Print, limited number available. The latest book, A Potpourri of Single Shot Rifles and Actions, Volume III, in the series on single shot rifles and actions, covers over 50 different single shot rifles not covered in the previous books. As with the other books, this one covers the the history of development, many photos and drawings, design and construction features and some gunsmithing instructions. Covered are some of the new rifles available and many old and obsolete rifles. Some of the rifles included are the De Haas-Miller, Hagn, Peregrine, Hoch, Gentry, Weihrauch, Navy Arms Rolling Blocks, Plus many more American and foreign. This is the first book written by Layman. For the newest book on this subject see his new book above. Information and photographs of Military Rolling Block rifles which are extremely rare. Provides tips on identifying these scarce specimens. Also includes a recently discovered shipment chart from 1888-1921. This edition is necessary for collectors to keep abreast with current research on the world’s greatest single shot military rifle. This book is a standard reference for Remington's military rolling block production. This book is hand loading data, loading techniques, and shooting tips. When ordering the above parts please order by the part description. Shipping charged as marked on the individual item will be USPS Media Mail.